It is difficult to square the concepts of frozen lakes and heavy southern drawl. They just do not seem to go together. But, here I am in Fayetteville, North Carolina, dressed in layers of fleece, wool, and gore-tex, trying to capture the winter scene in my sketchbook with fingers frozen numb. The lake outside of my son’s apartment is full of ducks, Canadian geese, and swans, all walking on the lake’s surface in the early morning chill. I expect this scene in Oregon. I am surprised in North Carolina. The weather is not the only thing that surprises me in this southern city. Yesterday, I was writing with a view of swans bobbing for tasty tidbits at the bottom of the lake and could hear bombs, mortar fire, and machine gun bursts. I am staying within two miles of Fort Bragg where my son is stationed during his medic training. There are firing ranges and mortar targets throughout the 140,618 acres of the Bragg military installation. Swans and bombs do not logically belong in the same scene, but here they are. Fayetteville was around long before Fort Bragg was built in 1918, but today it clearly revolves around the military facility along its northwestern edge. Everywhere I go there are countless military personnel. So many that in one store I casually walked up to a green-clad young man I thought was my son and tried to finish a previous conversation. His southern manners saved me from serious embarrassment. It was inevitable that my first stop as a tourist was to visit the Army Special Ops Museum with my son. Located in downtown Fayetteville and funded by Ross Perot, the museum showcases the history of Army Special Operations since World War II. It was an unusual place to find an aging, hippie pacifist, but mothers are often called upon to follow sons and no one promised it would be easy. Stores proclaim their pride in the soldiers with big signs and American flags. Streets are named for generals, wars, battles, and heroes. There is even an All American Freeway. But, along side patriotic displays are hints of Fayetteville’s past. Hay Street, Cotton Valley Drive, Suregrow Court, Poultry Place, Wheat Way, Potash Place, and Sourgum Way recall its agricultural roots. 120 miles from the Atlantic Ocean, Fayetteville established an inland port on the banks of the Cape Fear River. This access to ocean traffic allowed a hearty commercial trade and made it a center of government before Raleigh was designated the capitol of North Carolina. 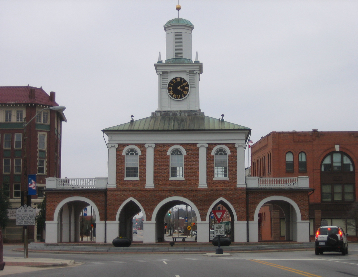 Fayetteville was the hub of six plank roads, the first constructed in 1849. The longest, to what is now the Winston-Salem area, was 129 miles long. Built on a foundation of logs, three inch planks were laid and covered with sand. With the inland port and the plank roads shortening travel time for shipping, Fayetteville’s economy flourished until railroads crisscrossed the state. Named after the French Revolutionary War hero, Marquis de Lafayette, most of the early settlers arrived from Scotland in the 1730’s. After the Revolutionary War, and without a designated state capitol, the legislature met in Fayetteville and, in 1789, ratified the U.S. Constitution and chartered the first American state university, the University of North Carolina. Nearly burned to the ground in 1831 and in the path of General Sherman during the civil war, Fayetteville has rebuilt itself twice. Throughout four historic areas, there is evidence of meticulous preservation and restoration. Many sites are not open to the public, but walking in the footsteps of our history and standing in the footprints of our ancestors are worth the side trips. My first walking trip was to see the Cool Spring Tavern. It is the oldest structure in Fayetteville. Built in 1788, North Carolina delegates who ratified the U.S. Constitution stayed there, probably discussing the future of our young nation over the local brew. Still in the McKethan family, the Cool Spring Tavern is not open to the public. Even so, I enjoyed imagining the scene in the 1700’s. Further along Cool Spring Street is the Cross Creek Cemetery. Opened in 1785, it is full of memories and connections, loves, and losses. As with all old cemeteries, youth and age stand out. Babies and children are everywhere, reminding us of the hardships of 200 years ago. Young men and women in their 20’s died in war and childbirth. And, old people lived out the full measure of their lives without them. It must have been exciting to witness the birth of our nation, but it was not an easy existence. The tombstones are weathered and moss covered. Many have eroded beyond recognition. The fallen ones are left where they are, many with sod growing over their edges. Even the stones, placed to mark eternity, are slowly being reclaimed by mother nature. Another day, a warmer one, I took my sketchbook to the newly opened Cape Fear River Trail. 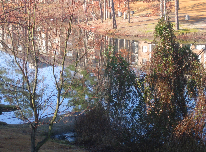 This four mile, urban trail, meanders alongside the Cape Fear River. It gently takes you through longleaf pines, oaks, magnolias, poison ivy, and many other unfamiliar trees and shrubs. The longleaf was nearly exterminated by shipbuilders who harvested the trees for their resin and pitch. Workers were called “tarheels” because the pitch stained the bottoms of their feet. 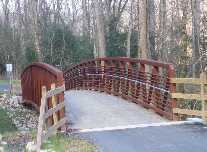 The trail crosses several wetlands or swamps using boardwalks and bridges. One bridge, an exquisitely wrought rusty iron, posed for both pictures and a sketch. 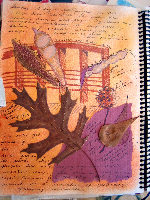 Also, into my sketchbook went some dried leaves and some sketches of pods that were too three-dimensional to glue onto the page. The colors, textures, and forms recall cool breezes, bird songs, rustling leaves, dry winter smells, and the warm companionship of my daughter-in-law and newest grandbaby. After several days of discovery I had gathered enough information to locate the “best” local BBQ. One person indignantly asked, “North Carolina or South Carolina?” I diplomatically replied, “North Carolina,” and was given directions. Twenty minutes after our take-out order was filled, we were enjoying great North Carolina BBQ with a hint of a not-so-secret family recipe for spicy sauce. The cold fled days ago and was replaced by warmth and sun. I walk with my grandson on most days and am rewarded by the ducks, swans, geese, turtles, herons, cardinals, and woodpeckers. Trees and shrubs are showing white, pink, and red buds. I am usually alone on my walks. It seems that few people spend time outside enjoying the natural beauty of Fayetteville. That is unfortunate. I suppose it is because the population is so transient, in and out of Fort Bragg, not there long enough and too busy to notice. My sketchbook is filled with my wanderings. But, what is not on my pages is the litter. The lake is full of it, including a green, plastic chair. The streets, with stately columns and inviting porches, are lined with it, everything from whiskey bottles to condoms. There is so much broken glass the roads glisten. It must be difficult for the locals to make the effort when so many people are just temporary citizens. But, I am a temporary citizen and it would not occur to me to toss... anything out the window. My upbringing and my back country, leave-no-trace ethic do not allow it. It is too bad, Fayetteville has a layer of beauty that is easily missed and hiding it under litter is a tragedy. As I sit here, the sun has gone down over the lake. A great blue heron, a pair of cardinals, and three turtles have visited me today. The door is open to the sounds of the ducks’ quacks and geese watery landings. I hear the coo of mourning doves, the rustle of crisp, dry leaves, and the plodding of a C-130 military transport overhead. Fayetteville is an unusual place. If you go, be sure to visit the city’s Visitor Center and the office of the Downtown Business Association. And, track down the local newspaper office, the Fayetteville Observer. This is one of the few independently owned newspapers left in the country. Their front office has a wonderful display of old newspaper equipment and processes. Tell them Dianne from Oregon met you and says, “Hi”. They are friendly and eager to help you find that layer of beauty in Fayetteville.